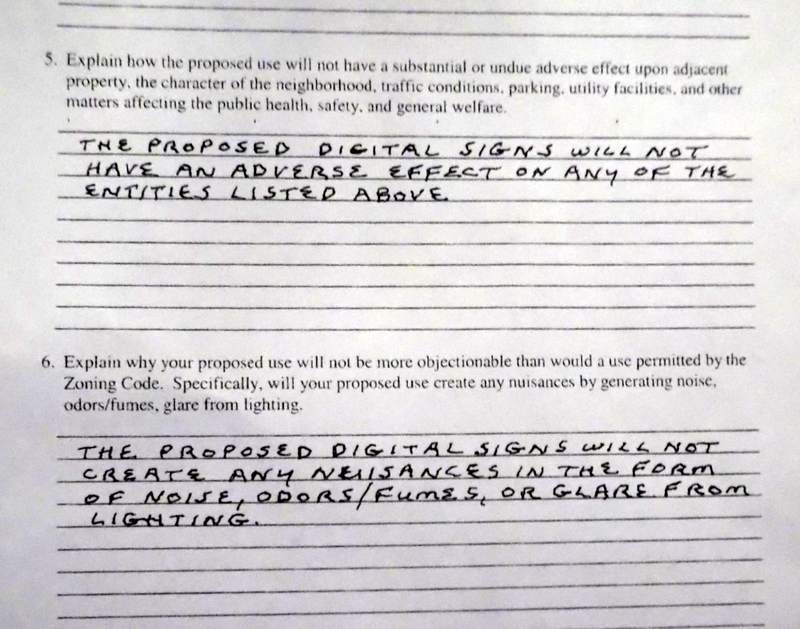 Below is a discussion with a fuller outline of the variables that should be considered when evaluating the use of Electronic Variable Message Signs at any particular location (and, in particular, at the location of Proctors along State Street and Jay in downtown Schenectady, the subject of the posting above, and other busy and complicated locations, such as the coming Mohawk Harbor casino and mixed-use development). 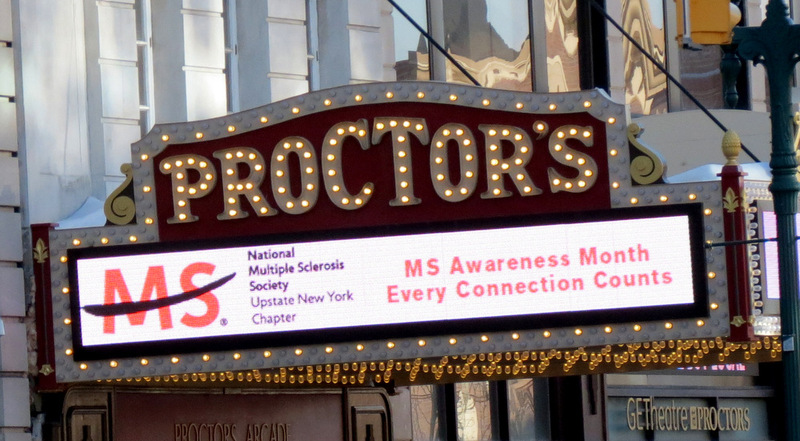 Even when couched in planning jargon, they are common-sense factors that all seem to point to a conclusion that rapidly-changing electronic signs have no place at the Proctors location. City officials should, we believe, apply similar concepts in evaluating the electronic displays at the Mohawk Harbor Rivers Casino and other busy Schenectady intersections. There have been many studies of electronic variable-message signs, due to their increased potential for distracting drivers. Recent studies, primarily focused on high-speed roads rather than urban or suburban streets, have found no significant increase in accidents near variable message signs. Their authors have, however, warned that different conditions may warrant different conclusions. See for example, the Federal Highway Administration’s Report on “The Effects of Commercial Electronic Variable Message Signs on Driver Attention and Distraction: An Update” (Pub. 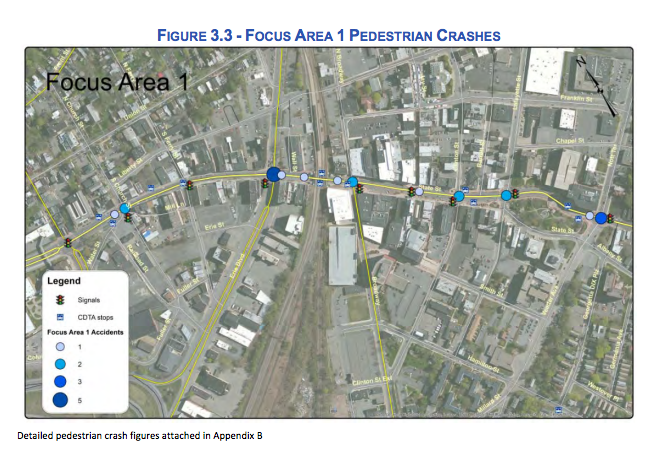 #FHWA-HRT-09-018 (Feb. 2009); and “Context-Sensitive Signage Design” (by Marya Morris, et al., for the Research Department of the American Planning Association, 2001). [I]t cannot be assumed that all CEVMS are equal, even those of the same size, height, and LED technology to display their images. The impact of a CEVMS in an undeveloped area with relatively low levels of nighttime ambient lighting may be quite different from that of a CEVMS in a more urban context among other buildings and structures in an area with high nighttime illumination levels. Furthermore, characteristics of the CEVMS displays may, in and of themselves, lead to measurable differences in distraction, such as information density, colors of figure and background, character size and font, and message content. These characteristics cannot be assumed to be equivalent for purposes of comparisons. Longitudinal Location. The location of signs in their relation to such highway design features as intersections, channelization features, traffic control devices, and features which require a high level of attention to the driving task. Thus, highly relative to Proctors, the FHWA report stresses that: “[C]ompelling information from CEVMS used for advertising may conflict with important roadway safety information conveyed by nearby traffic control devices (official signs).” Likewise, the APA research study points out that “commercial signs should never compete with traffic control devices for attention”. The channeling of those seeking and departing a parking space increases the need for additional attention to the driving task. Frequent changes in speed for yourself and other drivers increases the likelihood of accidents. The inevitability of jaywalkers, often dashing from behind or between moving or parked vehicles, increases demands on the driver. Lateral Location. This refers to the distance that signs are set back from the highway, measured in distance from the edge of the main traveled way. Lateral location standards also consider the angle of a sign on which the messages are displayed relative to the line of sight of motorists on the adjacent highway. 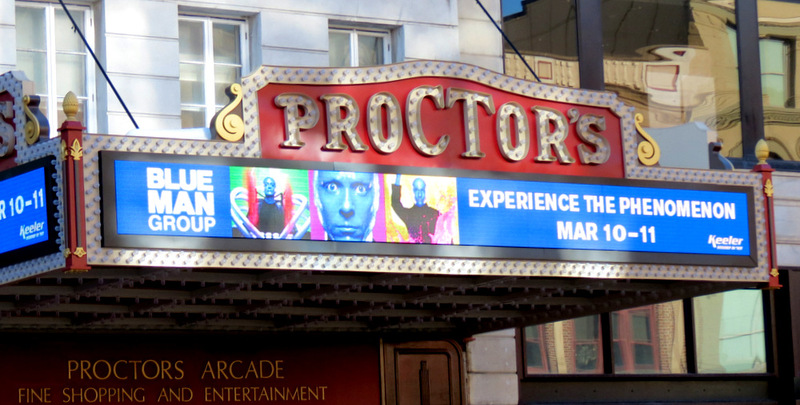 Proctors marquee could scarcely be closer to the “edge of the main travel lane”; while the front panel is difficult to read unless traveling slowly directly in front of it, and the GE-Theater-Apostrophé Lounge message board is set at an angle requiring drivers to take their eyes off the road at precisely the place where they should be giving the road and nearby pedestrian and parking activity their full attention. Characteristics of the Signage: Size, length, height; visual angle, distance first detected, contrast ratios, day/night settings; ability to hold attention, special effects (wipe, dissolve, scintillate); whether full-motion video or effects mimicking motion are used; type of Content: text, graphics, mixed, targeted; Text: word count, font size and type, color, content, legibility, affect; Graphics: size, complexity, color, content, affect. ; whether Driver Interaction is encouraged. Characteristics of Drivers. Age, gender, and demographics can come into play. Driver familiarity with the location is very important, as is experience driving under likely conditions (e.g., weather, darkness). 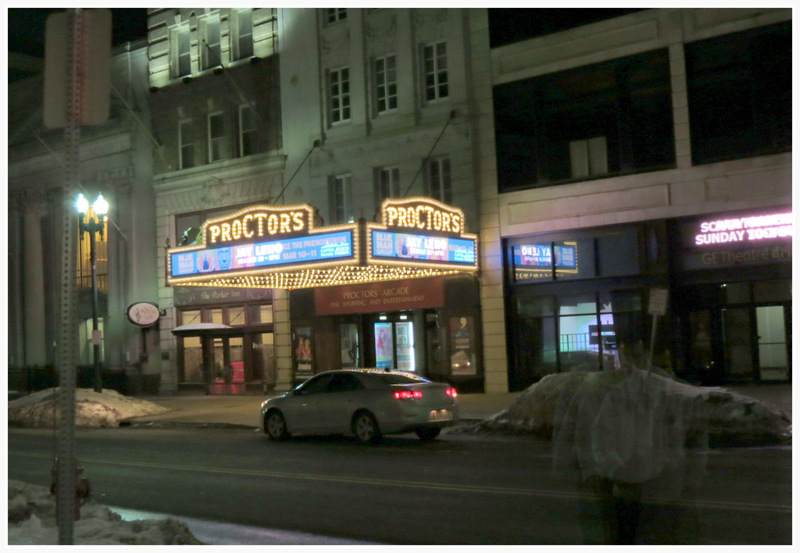 Fatigue and use of alcohol or drugs are often relevant factors for those driving at night along downtown Schenectady. And, Distractions inside the vehicle (such as, conversation, eating, backseat drivers supervising parking, cellphone use) also lower driver attention and reaction time. Primacy of Information. The information on CEVMS should be responsive to motorist’s information and direction-finding needs, concentrating on messages that identify business sites, give directions into the site and its facilities (parking and loading areas, internal circulation pattern), goods or services available, and other information necessary to use the site (e.g., hours of operation). This principle suggests that CEVMS located in close proximity to traffic control devices should avoid the urge to dazzle and entertain us. Older and Younger Audience Members. 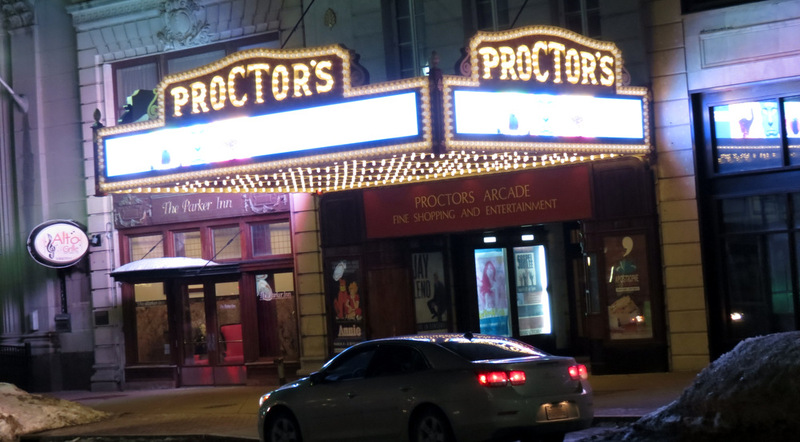 Proctors attracts a large number of older and younger audience members, given its selection of entertainment. Many older drivers come for their own entertainment or to accompany young audience members. 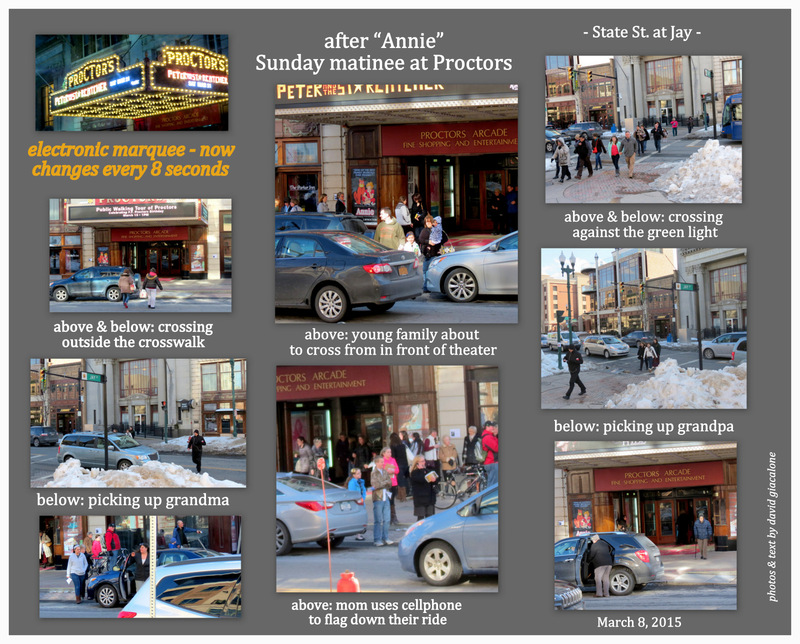 And, Proctors events are often “must-sees” for young kids. (1) Problems of Older Drivers. 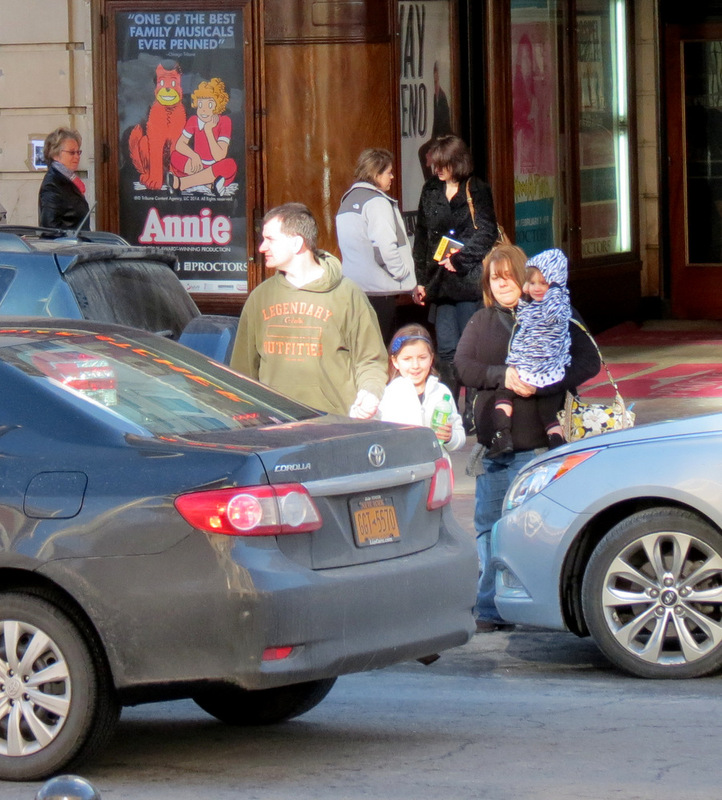 As driver and as pedestrians, older folk present the need for greater attention. The Minimum Required Visibility Distance (MRVD) for older drivers may be considerably longer than for younger drivers because of diminished abilities to recognize and process information and to execute lane-changing maneuvers. This is not merely related to vision impairment. The concept of MRVD makes it obvious that factors such as reaction time, decision making, and problem solving increase the distance needed by the older driver to detect and read signs, and that these factors can create visibility problems for the older driver even when visual impairment is not considered. In general, older drivers not only have problems seeing what younger drivers can see at a given distance, but they also need to recognize and be able to read signs at greater distances to provide them with the additional time they need to respond in a safe manner. (2) Younger Audience Members. 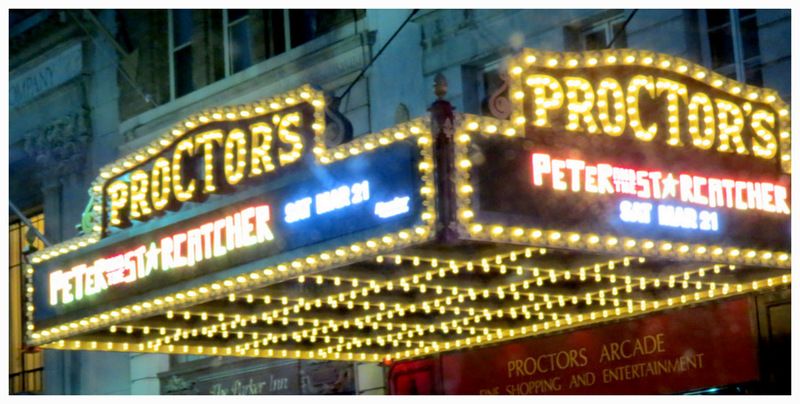 Many small children will be very excited, both entering and exiting Proctors. 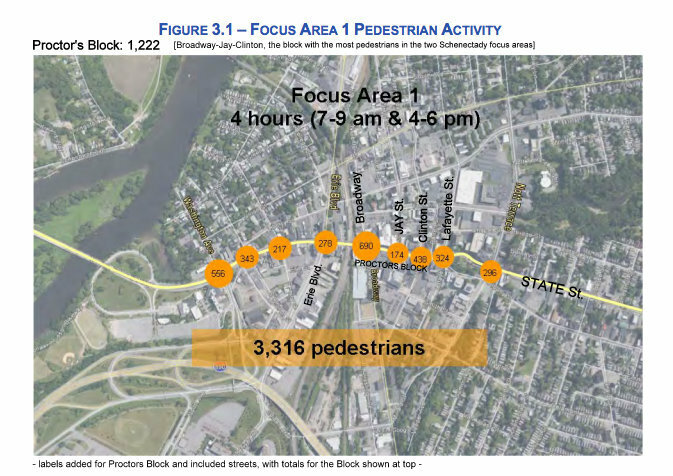 That increases the likelihood of behavior that could affect traffic along State Street, and requires yet addition attention. 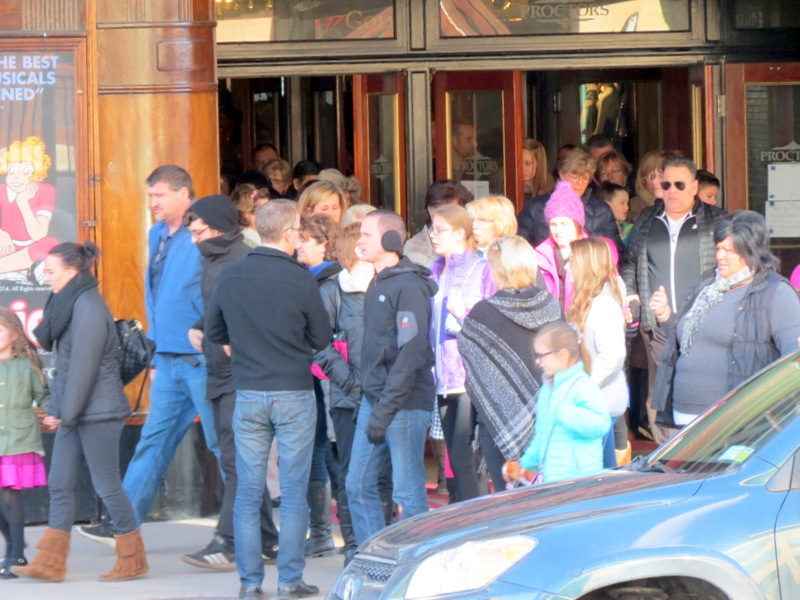 Some will need to be carried, complicating navigating across streets, and increasing the time a pick-up may take. This situation requires that rubber stamps be set aside; that the Code Enforcement Office insist Proctors seek a CEVMS special use permit; and that the Planning Commission require that Proctors show the lack of significant impact on traffic conditions, and on safety, health or other public welfare issues before it speeds up its roadside variable electronic signs. 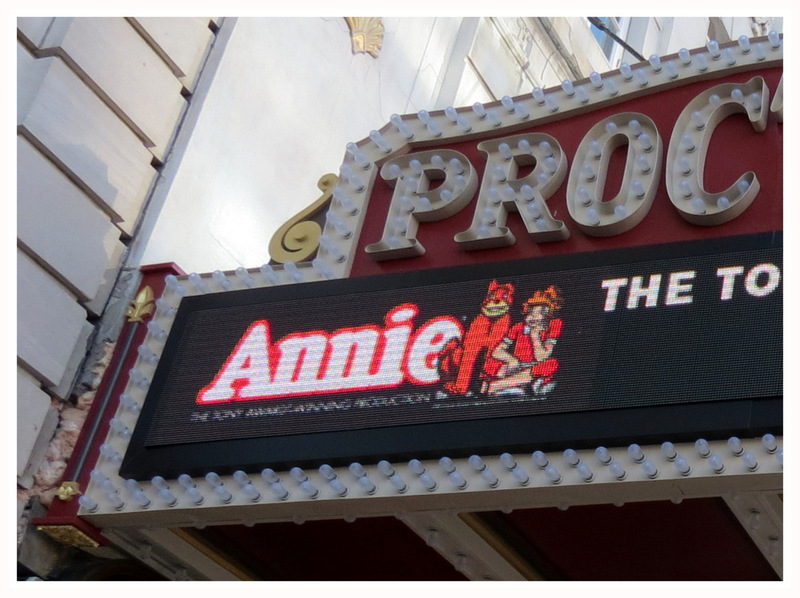 This entry was posted in photos, politics, Urban Casinos, Zoning/Planning and tagged Proctors electronic marquee, Zoning for urban casino by David Giacalone. Bookmark the permalink.